Ho hum, it’s come to this. Beautiful Adelaide Oval has been renamed Bob Neil #3 for the day, as the Members’ Stand is filled with society’s detritus as well as some Riverside supporters. Blacks footballers and also some SCUM team members filled the famous wooden benches on the western side of our glorious ground, second only in beauty to Football Park. 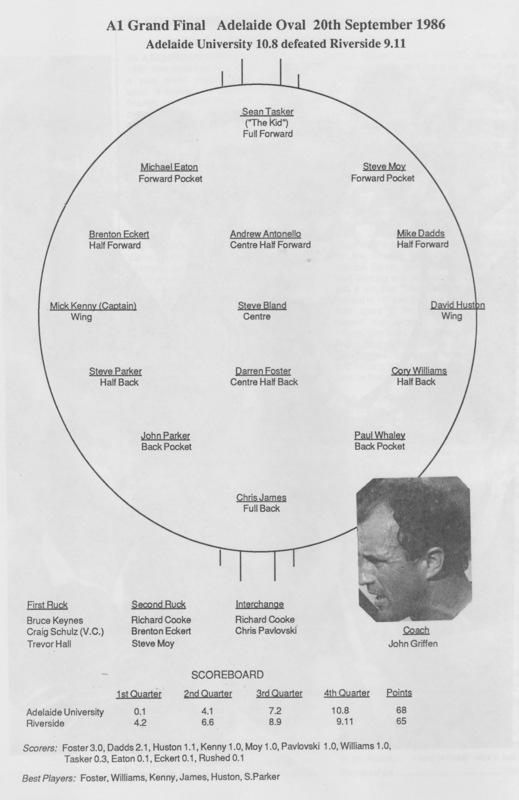 In my role as Adelaide’s foremost sporting chronicler, I was always on the lookout for a new angle, so I’d teed up with Chocka Bloch that I could record Griff’s pregame address and his revups at each break. Of course this agreement wasn’t communicated to Team Manager Maloney who made it his business to interfere with this ground breaking exercise. 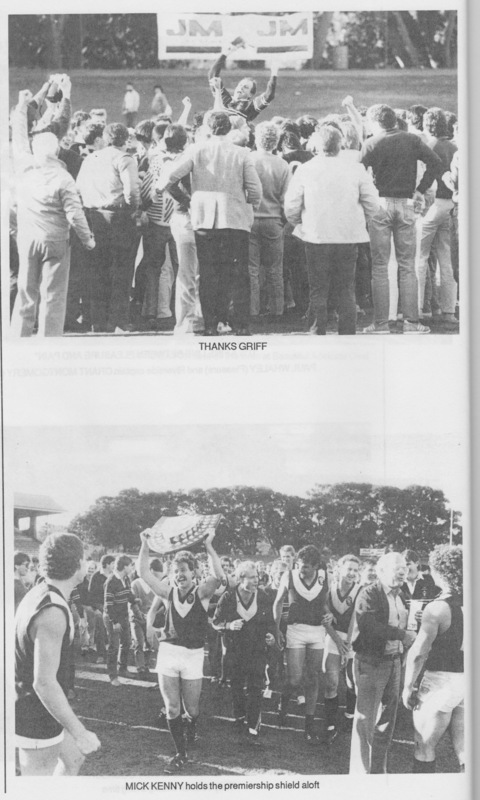 But with the Blacks making a tardy start, all in attendance agreed that the game was over at quarter time. Apart from Boz, Sandy and Griff, no-one even bothered going out onto the ground at the first break, the Uni crowd annoyed that they’d turned up to watch this dross. If it wasn’t for the smuggled eskies full of West End long necks hidden out the back near the practice wickets, we’d have gone home. There was a flicker of enthusiasm in the second term as the singing sauce kicked in. 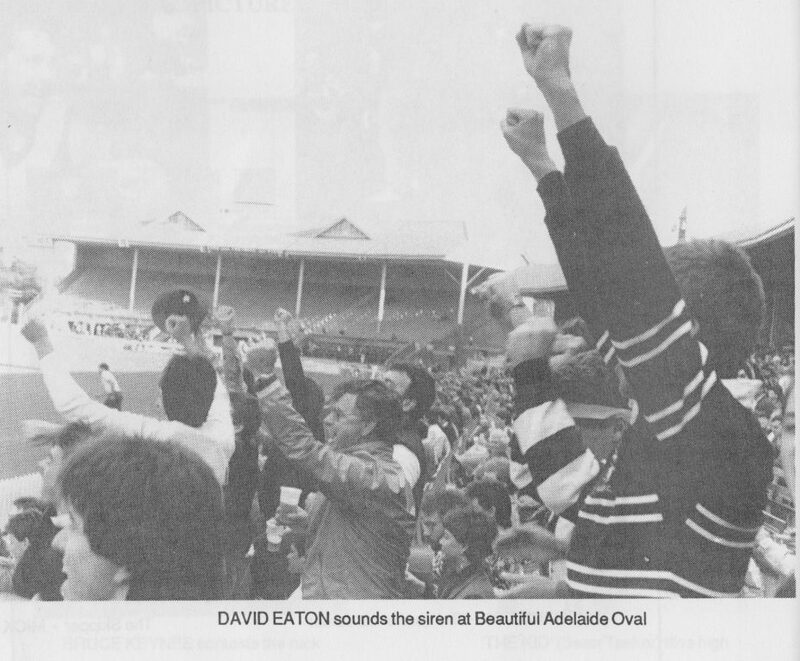 Some of the more pissed vocal contributors mixed sledging of the sleeping habits of the Portsiders with raucous renditions of our national anthem, lyrics altered somewhat to reflect the attendance of the Uni #130. I can just imagine how well that will go down at the Seoul Olympics. The game meandered towards its conclusion in the third quarter, never at any stage reaching LeFevre pitch, but Riverside failed to put Uni away, so it was with some trepidation that I reminded Chocka of our agreement as I wandered out to wide mid on for Griff’s final huddle of 1986. He told me to go and get knotted sort it out myself. He slipped my state of the art pocket recording device into his jocks sock, pressed the record button and wandered over to the scoreboard pocket. Here’s his recorded account of the last few minutes of the Blacks’ 1986 Grand Final victory. 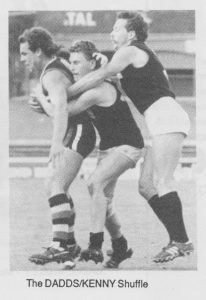 23 minute mark final quarter 1986 A1 GF. Rivvies up by 10 at Bob Neil #3 having led all day in a low-scoring affair: Eaton squares the ball from deep in the north-western pocket in accordance with master coach Griff’s strictly-enforced team rules. Likewise pursuant to said rules I am plonked at the top of the square. My opponent, ignorant of cunning said team rules, is protecting the goals. The ball lands neatly on my chest. I kick from just 15 metres out, dead in front. Just as well. The ball careens off the outside of my left boot at so close to a right angle it’s not funny, but still manages to sneak through. I pretend it’s all part of the plan. Just another team rule. Phew. That was close. 26 minute mark. Rivvies up by 3: the ball comes in long and deep to the south-eastern pocket. A pack forms and is then brutally smashed apart like a Bob Neil stab-pass connecting with a Uni poofter’s coke-bottle lensed, heavily-rimmed glasses, secured by a thick rubber band and masking tape, as Keg Fosterrrrrrr! grabs a huge speccy and then calmly shows how it’s done. The Blacks hit the front for the first time in the match. 27-30 minutes. Blacks up by 3: Rivvies’ ruckman repeatedly belts the ball out of play over the boundary line. Blacks are incredulous but grateful. Thank you Rivvies’ ruckman, you numbskull. 30 minute mark. Blacks up by 3: the Bob Neil chant to (“Bobby Neil Bobby Neil Bobby Neil….”) makes its public debut, echoing through the vastness of #3, inspiring the good guys to battle to the last against the evil Orcs from deep down in the depths of Port Road. 31 minute mark. Blacks up by 3: There can’t be more than a minute left. Rivvies get the ball on their back flank. It’s their last roll of the dice. They run, bounce and carry down the eastern wing. 1 bounce, 2, 3, 4…where are we?! They’re going to go all the way! But wait. A blur. NASA Houston throws the switch on the after-burners. He sprints a full 100 metres and, with one final desperate lunge, brings down the would-be Rivvies match-winner. Baaaawwwlllll! 31.3 minute mark. Blacks up by 3: Blessed. Freakin. Siren. Tears of relief. Overwhelming sense of achievement. Unmitigated joy. A moment in time never to be forgotten. Ever. 1hr 27 minutes post-siren: Brian still lurking around the showers hoping to catch a glimpse of the Brick Shithouse’s “muscle[s]”. A band of Blacks warriors (“Peckers”?) wanders out to the hallowed turf and sits centre circle, bootless but for Eckert. Eckert holds offending boot and a packet of matches. The rest is history. The majesty of the Creswell Stand. It’ll still be there in 2086, mark my words. Beautiful Griff, stick around and create a dynasty. About time Kenny, now you can piss off and retire. bask in premiership glory. 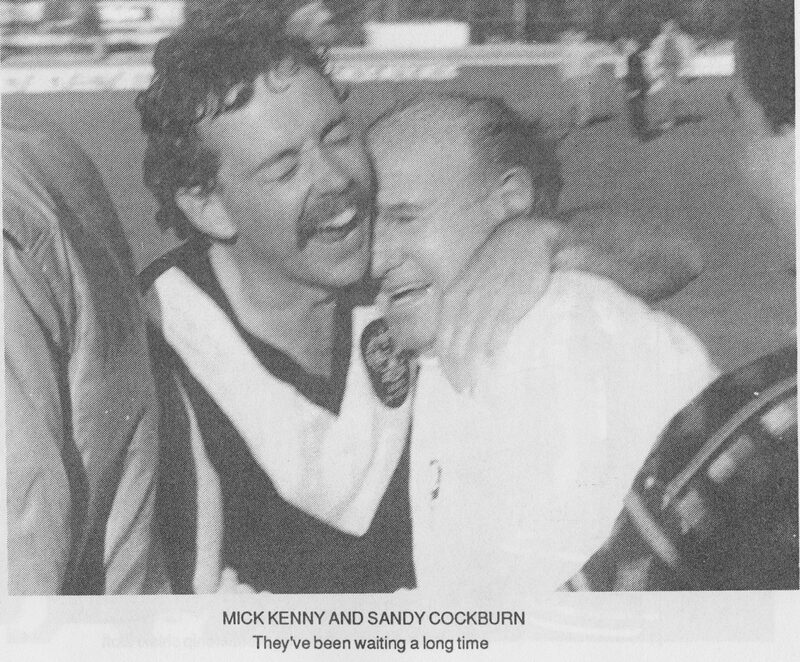 Little known fact: Sandy is fifteen years younger than Mick. They’ll win the next five flags. Griff has a job for life. Mark my words twice. Brilliant finish to a brilliant season for all involved. If anyone tried to “mark” the words of Gordon Agars, the words would slip through their butter fingers and drop into the gutter. Farewell Gordon Agars, it’s been a slice. Eckert looks short next to Bruce Keynes, but anyone would! 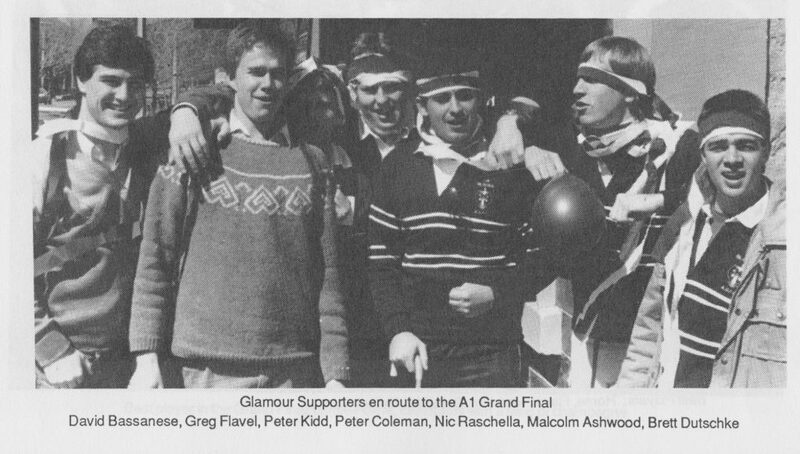 Riverside ruckmen: I remember them. Hardest team I every played. Great write up all year Malcolm. Thank you for this. The last 5 minutes always sits in the forefront of my mind. The willingness to never give in and stick to the game plan is a credit to our great coach. The 26 minute mark was huge , Rivies Greeny had been on my case all day. I was attacking a loose ball when Corey Williams legally ironed out Greeny with the best hip and shoulder.He was on his knees for the last 5 minutes. How ironic in the end that the highest paid player on the Riverside team(AG) would clear the ball from their defense kicking across the ground into the center of the ground. With Greeny still down I swooped on the ball and remembering our team rules , top of the goal square , and Big Keg Foster marked strongly and kicked truly. That day is the sweetest moment of my sporting life. ‘Twas indeed a special day. Whitney surely the 150 run partnership we shared would be a close 2nd ? 6 per cent yes a significant glamour side involvement with the Knackery ! Bryan with a axe at Griffs place and Wendy James after being with every one at the Bay disco on the Sunday night and then Wendy being at work ringing,Chris to tell him to hurry up to get ready for mad monday all sensational memories thanks Swish ! Ah lovely work Gordon. Sweetest moment of my life when the siren went. Griff insisted we do 10 hill-runs (up the side of Montefiore Hill) every Tuesday AFTER training, throughout the season, without fail. He said we would remember them when the time came. At 3/4 time of the GF he took us over to scoreboard. We were 14 points down. He reminded us then of the hill-runs. He made the unassailable point that our opponents had NOT done the hill-runs. Ergo we were fitter. Ergo we would win. It was a master-stroke. We all believed at that point that we WOULD win. We were a strong team, but we were brilliantly coached. Blandy bumped someone that day so hard that the umpire paid a free kick, literally for “too hard”. As maths-science students will be quick to point out, 10% of this team is no longer with us – Moysey and Nose – both paradoxically larger than life. Wonderful memories here Gordon. Carn the Blacks. Was with you every step Mal. The Dover, onto The Hard Rock Cafe with the Uni scoreboard sign bent in half with us. Sunday at Griffs , Bryan going for a swim then onto the Bay Disco. Slept on Griff’s couch then onto a naughty lunch on Monday. but I have thoroughly enjoyed the journey nonetheless. 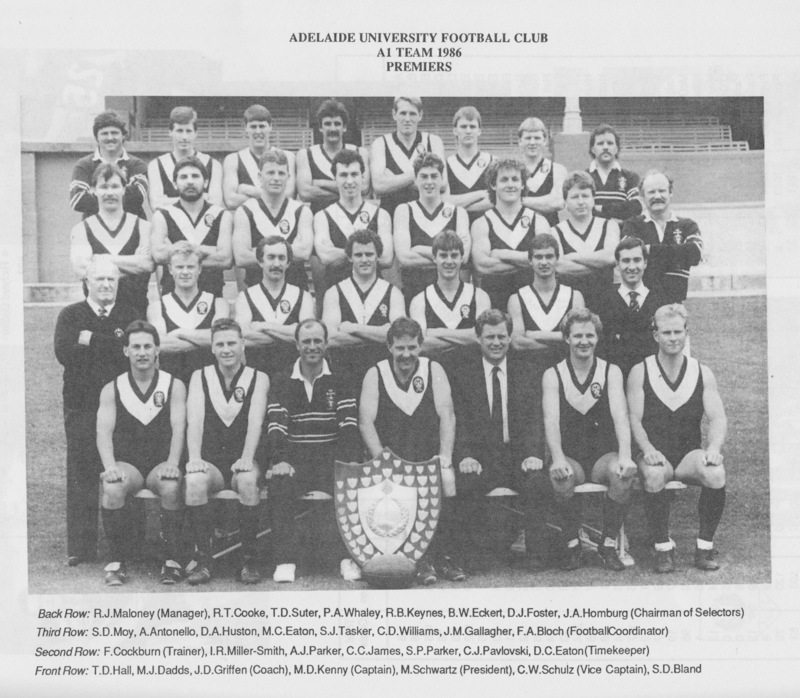 Swish an outstanding finish to a great season of articles as was the A1 Flag in 1986 an outstanding finish to a great season for the club. Was that the last year of the club being at the Queens Head? After some thought (!) i realise that I have no idea at all what I did after the presentation of the premiership cup. However, i suspect it involved the Head, and copious cold beverages. On behalf of Gordon, I appreciate the enthusiastic response to his ramblings this year. Well done Swish – like soldiers, your articles have kept us not growing old. Champion work – oh to do it all again. Gordon you have brought joy and light to many during these dark stormy days. It seems the 30 year anniversary coincides with another once in a lifetime event – the Great Blackout. you really do have some pull in this state! A superb sequence of memories / what a time to play at the Blacks it must’ve been. My time was brilliantly enjoyable as well and I love the extra hill sprints you mention Griff made you guys do Daddsy – in life you get out what you put in…. It’s time for the current generatjon to step up and enjoy such success – come on the blacks in 2017. A great day, the Blacks finally triumphed over Rivvies in a big game. Those of us in the crowd singing the inaugural public Bob Neil chants absolutely loved it. Such elation from the team who had all worked so hard. Brilliant recaps Gordon, have led to great reminiscences, love your work. Who can believe it was 30 years ago? This was the day I realised I was playing for TWGFC. Rivvies were a tough team to beat and the Riverside ruckman Bubbles Milne was the toughest ruckman I every played against. He was big and strong and played checkside. I always tried to jump over him, which was difficult. 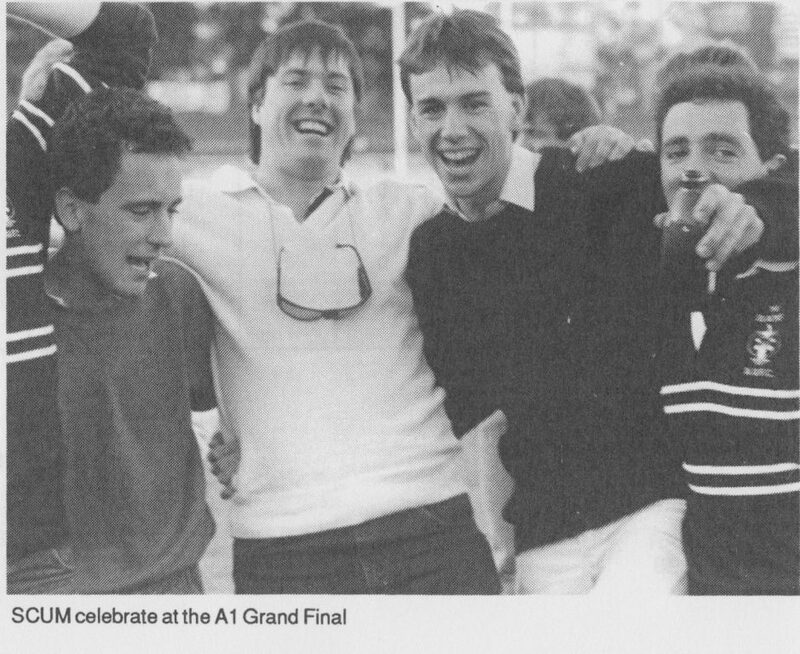 I think it has he who broke my nose in an early final at Unley Oval (1981 or 1982?). $58000 for the team payroll. That is about $3000 each. Not as much as the T.E.A.S. Thanks Gough Whitlam! I remember having a beer with Bob on the northern hill in the last quarter when the “Bobby Neil, Bobby Neil” chant went up. Poor old Bob was hopping from foot to foot with embarrassment, not knowing where to look and generally just hoping it would stop – which pretty much set the scene for the ensuing three decades! Superb,Pound4Pound and ohh how true !